HANG HUNDREDS of ITEMS at HOME, SCHOOL, GARAGE or OFFICE!! • Easily push into Sheetrock, Corkboard, Foamcore & even Soft Wood. • Hang your Keys, Calendars, Sun/Glasses, Home Decor & so much more!! • Awards, hair-ties, Ribbons, Team Jerseys, Scissors, BBQ utensils, Flashlights, etc. • Craft Projects: Embellish using die-cuts, glitter glue & silk flowers for your own handmade custom CraZy Tacks! HINT:Hold the "Metal Hook" (not plastic) & Twist'Back'n'Forth as you Push/Insert (~use Pliers to hold the metal hook as you twist~). ✮Also, Bend the Hook out for Calendars, sunglasses & many larger items. Get Yours Today with our 30-day 100% Satisfaction Money Back Guarantee! HOW MANY WAYS? : Literally 1,000,000+ (over 1 million!) of items could be hanging from CraZy Tackz right now! You can use at Home, School, Office, Garage, Garden, Shop, Inside or Outside. WHERE: Easily insert in Sheetrock, Drywall, most Craft materials including foamcore, Corkboard (not the thin stuff!) & even soft wood (for harder surfaces, use pliers to help insert). INVISIBLE: Not really, but close! You will hardly notice when in use & when you remove, only a small pin hole remains (easily painted over). Most apartments & College Dorm rooms only allow push pins and not sticky hooks. BRAND X? : Our "all metal" design is stronger, our gap is wider & you can bend our hook out with pliers for even larger items. Our design keeps the weight closer to the wall & has a wider 'stopper' so it displaces the weight better which causes less stress on the wall. SIZE: Slightly larger than a push pin ~ Measuring 1-1/4" long; 1/2" wide; 1/2" tack / pin; 1/2" hook. Please remember, it's just a "tack with a hook" ~ not for breakable items & not for everything, everywhere, but we bet you'll find a thousand uses! USES 1: The Inventor had a list of almost 100 items and that was great, but now with all our reviews & emails, we've compiled a list of Thousands of Uses! Keys, Calendars, Glasses, Home Décor & So Much More! USES 2: Organize Your Jewelry (Earrings, Bracelets, Necklaces) & Fashion Accessories. CUBICLES: Earbuds, Pictures, Badges, Signs & thumb drives. HOLIDAYS like Christmas, Halloween & 4th of July ~ PARTY: Birthday, Graduation, Wedding, Bridal, Bachelorette ~ HOME: Kids bedroom, bathroom, nursery, baby, Craft Room. USES 3: CABLES: Hang your cell phone & computer Charger, Coax & USB cables (hang rolled cords & wires on CraZy Tacks when done charging). ~ Interior & Exterior: Rope LED xmas String Lights, Plant Vines & Wind Chimes. AWARDS: Posters, Ribbons, Team Jerseys, kids Hair-Ties, Scissors, BBQ utensils, and PLEASE keep emailing us your Uses so we can list more! WHO: Makes a Great Gift for your Teacher, co-worker, son or daughter, aunt, uncle, bestie, mom or dad, boy or girl, grandma or grandpa & grand kids alike. "Got CraZy?...Tackz!" 2 in 1: When you combine a pushpin / thumbtack with a cuphook, voila, you get CraZy TACKz! Get this New Invention Today! 100% Satisfaction backed by our Manufacturer's 30-day Money Back Guarantee. 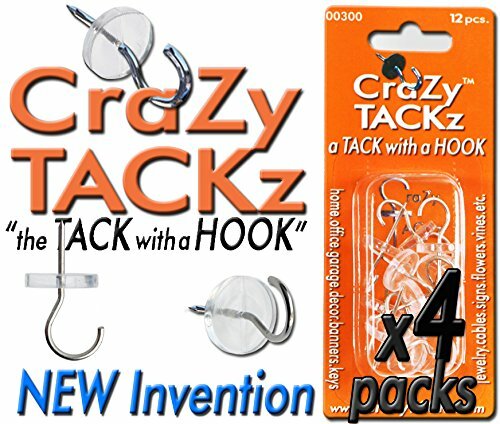 Manufacturer: CraZy TACKz ~ "the TACK w' a HOOK!" Publisher: CraZy TACKz ~ "the TACK w' a HOOK!" Studio: CraZy TACKz ~ "the TACK w' a HOOK!" If you have any questions about this product by CraZy TACKz, contact us by completing and submitting the form below. If you are looking for a specif part number, please include it with your message.